Chapala has aroused the interest of many Vagarians. For them, I have reproduced this analytical reference. 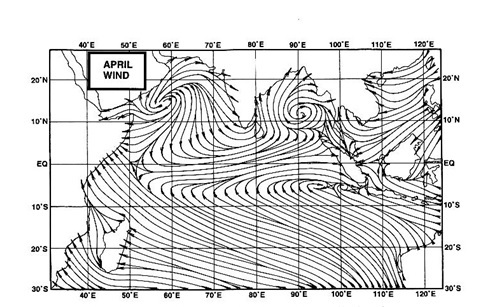 For the first time since records were started in the 1940s, a tropical cyclone made landfall in Yemen. When Cyclone Chapala struck the desert nation on November 3, 2015, it was just the third time in six decades that any cyclone made landfall on the Arabian Peninsula. Given the arid, vegetation-sparse, and rocky landscape, the rainfall from Chapala posed a dire threat. 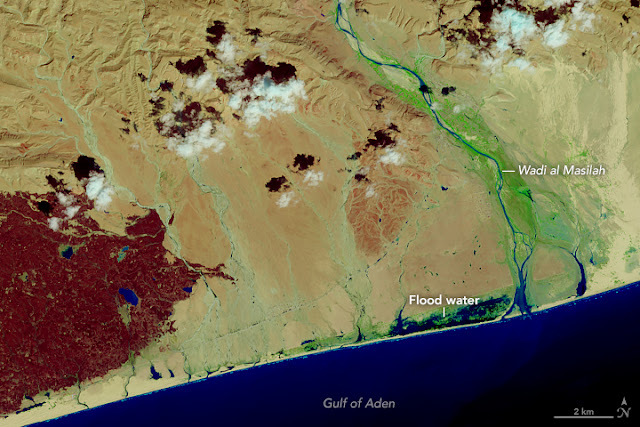 The Operational Land Imager (OLI) on Landsat 8 captured false-color images of flooded regions of eastern Yemen following the landfall of Cyclone Chapala. The top image was acquired on October 19, 2015; the second was acquired on November 4. Turn on the image comparison tool to see the differences. Both images use a combination of visible light and infrared (Landsat bands 3, 5, and 7, or green, near-infrared, and shortwave infrared) that makes it easier to see flood water on the landscape. In the November 4 image, shades of blue and green reveal areas with standing or flowing water; reds often indicate vegetation. Much of the region is marked by ephemeral river beds, or wadis, such as Wadi al Masilah. 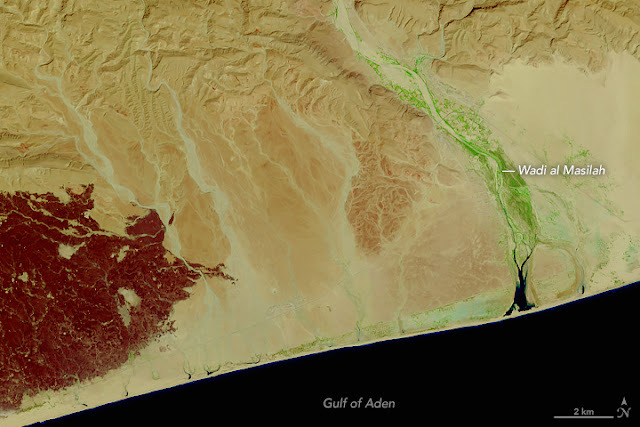 A line of green dots—likely pooled water—trails south and west from the Wadi toward the coast, perhaps through smaller stream beds. Near the coast, several kilometers of land are inundated with water, perhaps from the rainfall or from a storm surge. The map shows a satellite-based estimate of rainfall in Yemen from 3 p.m. local time (12:00 Universal Time) on November 3 to 3 p.m. (12:00 UTC) on November 4, 2015. The measurements are regional estimates, so totals reported by ground stations can be significantly higher or lower. The brightest colors on the map represent rainfall approaching 180 millimeters (7 inches) over the course of the day. On average, most of Yemen sees no more than 100 millimeters of rain in a year; coastal areas receive less than 50 millimeters. The rainfall data come from the Integrated Multi-Satellite Retrievals for GPM, or IMERG, a product of the Global Precipitation Measurement mission. IMERG pulls together precipitation estimates from passive microwave and infrared sensors on several satellites, as well as monthly surface precipitation gauge data, to provide precipitation estimates between 60 degrees North and South latitude. NASA Earth Observatory images by Joshua Stevens, using Landsat data from the U.S. Geological Survey and IMERG data provided courtesy of the Global Precipitation Mission (GPM) Science Team's Precipitation Processing System (PPS). Caption by Mike Carlowicz.